Lia Kvavilashvili’s research sheds light on memory processes in a variety of everyday contexts. For example, how do we remember to take a medication or keep an appointment (prospective memory); why do certain memories, words or tunes pop into our mind unexpectedly (involuntary memories) or repeatedly (intrusive memories); or how do we remember emotionally arousing and significant events (flashbulb memories)? She also studies the developmental aspects of these memory processes in children and old age, as well as their manifestation in various clinical conditions (e.g., schizophrenia, depression). Her undergraduate and postgraduate degrees in psychology were both obtained in Tbilisi, Georgia (former Soviet Union) at Tbilisi State University and Uznadze Institute of Psychology, respectively. In 1993, she came to UK as a Royal Society Postdoctoral Fellow to work with Judi Ellis at the University of Wales College of Cardiff. 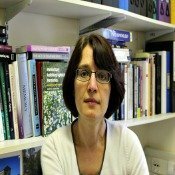 She joined the Department of Psychology at the University of Hertfordshire, in the capacity of Independent Research Fellow, in 1995. To learn more about her research or to participate in her experiments, feel free to visit her website.